We are selling 3D printers at Ducktoes Computer Repair and Services. Come and see our 3D printer in action any afternoon. 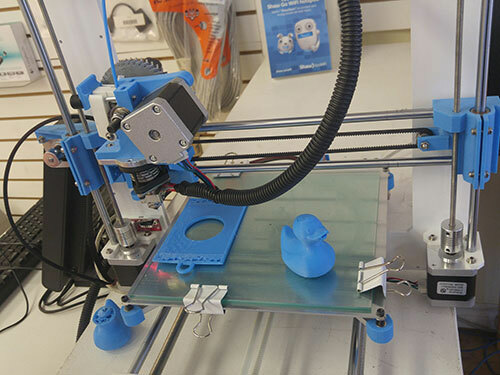 Ducktoes now has a 3D Printer at our computer repair shop in Calgary!! It can make 3D objects based on a 3D computer drawing of a model. We made this blue plastic duck (Ducktoes duck) with our 3D printer (see photo below) and many other things. Our heads are turned. We are totally captivated and playing around with it all the time. (The printer not the duck.) I have to keep yelling at the techs to get back to work. Actually the techs are totally consumed with their work almost all the time, even when when I want them to relax a bit, even when I order pizza. I have to pry them out of the basement to get them to eat. I yell downstairs with dire pizza announcements, such as “Hey, you guys, the pizza is getting cold!” Or if that didn’t work, with: “The customers are eating all the Hawaiian; all that is left is vegetarian!” etc. Ducktoes techs love their work more than food, it seems, a good thing. They also love the 3D printer. Before you print, you have to make a 3D model with 3D modeling software. The printing uses a process called slicing which divides the 3D model into hundreds or thousands of horizontal layers. The slicing of the model is also done with software. Each slice is printed with a layer of plastic. The printer prints each slice layer by layer, by laying down a layer of plastic on top of another over and over until the object is complete. The plastic comes out of a large spool, on a long plastic string. It is fascinating to watch so come to Ducktoes Computer Repair Shop in the afternoon to see for yourself. Now we’re printing the 3D printer parts so we can print another 3D printer with our 3D printer. Here’s the printer in action. A video taken by my son Ben Trigueiro. If you figure out what it is making, please don’t tell anyone since our loyalty might look suspect. If you must know, we did make the Flames one first, and that’s also a clue. Okay, you can tell…if you can figure it out. At Ducktoes, we love to try out the newest technologies and expand our knowledge and skills. If you’d like your own 3D printer, you can order it through us. I’d love it if you leave a comment below to tell me and us what you think. That would be so cool. Or really do stop by and see it for yourselves at 902 Centre St. N.
If you want to bring in a computer for repair, just stop by or give us a call at 403-219-3031.